Our first school project of the year is science based and it's not a science fair project! We still have a few months before the science fair project is due. This is by far a less involved project than a science fair project will be. As part of Leah's seventh grade biology class she was assigned a Cell Project. They were given a choice between eight options. Option 1: Make a cell game that includes directions, pieces/cards and be for at least two players. 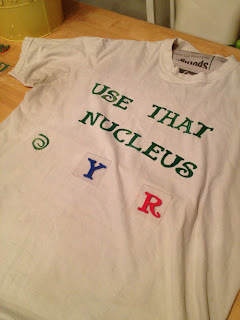 Option 2: Make a cell t-shirt design. Use a slogan or pun to advertise your message. An actual shirt must be made and has to be your own design. Option 3: Create a cell comic strip or cartoon. It can be drawn or made on the computer. Option 4: Create a cell song/rap. 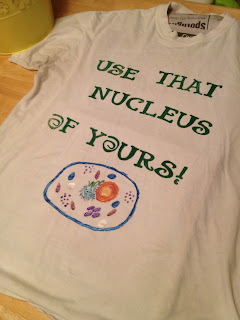 Keep it clean and make sure you cover the organelles we have learned. 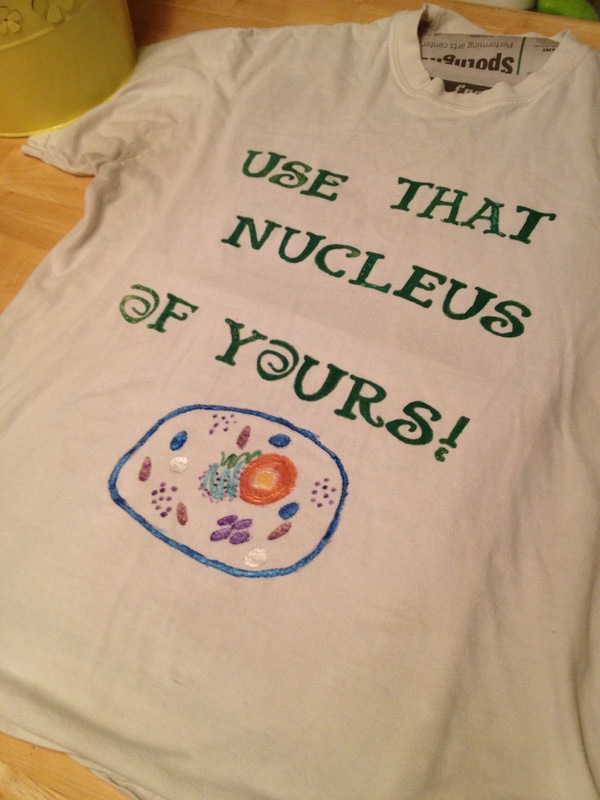 Option 5: Make a classified ad poster for a cell organelle. The poster should be attractive and catchy including your need for the organelle. Option 6: Creat an organelle "super hero" that will star in a movie. Make a poster advertising the movie. Option 8: Create a dodecahedron for a plant cell. An outline will be provided if you choose this option. Leah decided to choose option 2. We have plenty of old t-shirts laying around and I have countless bottles of fabric paint in my craft supplies. Leah had to think of what she wanted to say on her shirt and then somehow create it using Dad's old shirt. It didn't take long for her to come up with a good slogan idea. I had her draw it out so that she could visualize the design. Once we had a starting point it was time to gather the paint supplies. I found my yellow fabric paint bucket, my fabric paint brushes, and the letter stamps. I instructed Leah to search through the letter stamps and pull out all the letters she will need to use. The rest we put out of the way. 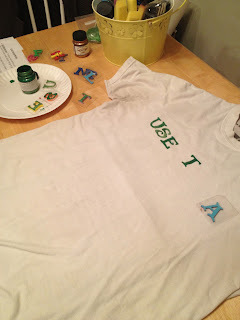 To keep the paint from seeping through the back of the shirt I showed her how to use newspaper and a large flat piece of cardboard to put inside the shirt. She set out her letters in order and put her paint jar on a paper plate to catch drips. The first letters make an appearance on the t-shirt. I kept reminding her to be very careful with letter spacing to be certain her words would be lined up nicely. That and no one wants the wording to end up in an armpit. To make the printing to be consistent she painted the fabric paint on to each letter. This allowed for a smoother application of the paint and would prevent her from having globs of paint pooling around the letters. Each letter was carefully placed and pressed down evenly. She gently pulled them up while holding the fabric down. This method created a uniform printing. By the mid-way point she was getting quite skilled at lettering. She was careful to put down her letters to verify her spacing. Any letters that need it got a little touch up with the paint brush. There was little need to touch ups since Leah worked very diligently to get the paint layered perfectly. After she completed her slogan she was at a roadblock. She wasn't certain how to complete the t-shirt. She was hoping that we would have been able to find some sort of cell nucleus stamp. She spent time going through my stamp box hoping to discover something that would fulfill her vision. Unfortunately my suggestion to freehand the cell was not her favorite solution. Instead of letting her get too upset I directed her to the computer. There she sought a decent picture of a cell. 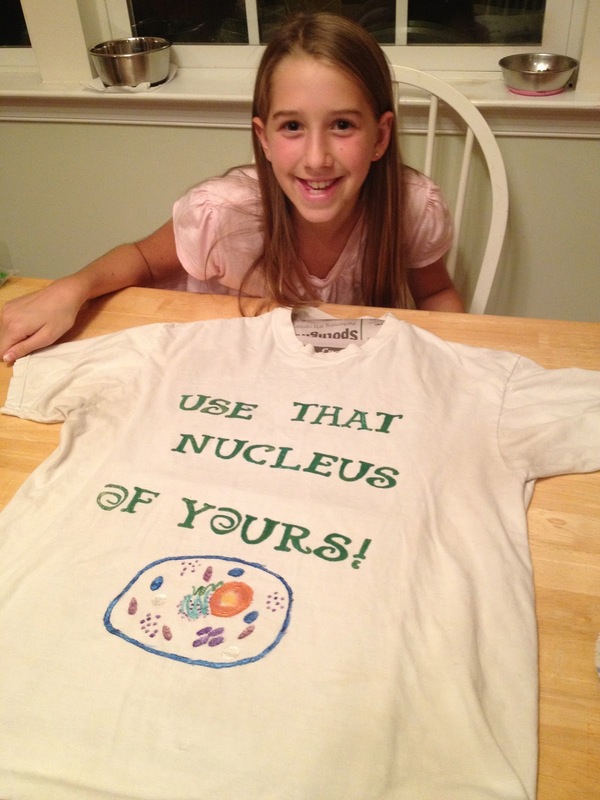 She chose a simple print and that became her guide for the nucleus. 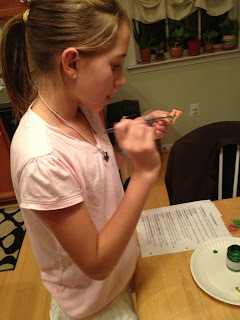 Using the numerous bottles of fabirc paint she began to choose the colors for all the nucleus parts. Still nervous to moved forward I stepped up to help. Sometimes you need a person to take that first big plunge into a project. I painted the cell wall for her. Using the blue she selected I created the starting point for her to fill it in. Once she saw that the cell wall looked fine she went forward. Having a perfectionist child can be difficult. She was so hesitant to try to paint that shirt even though I knew she would do very well. I sat with her and we walked through all the parts. I reminded her that this is just a shirt. It's not anything to be upset about if it does not look perfect. She painted away. And, you know what? It turned out great. She is so proud and so are we of all work she put into this project. I'm certain she will earn a good grade.